I guess you’d call it a purple print? 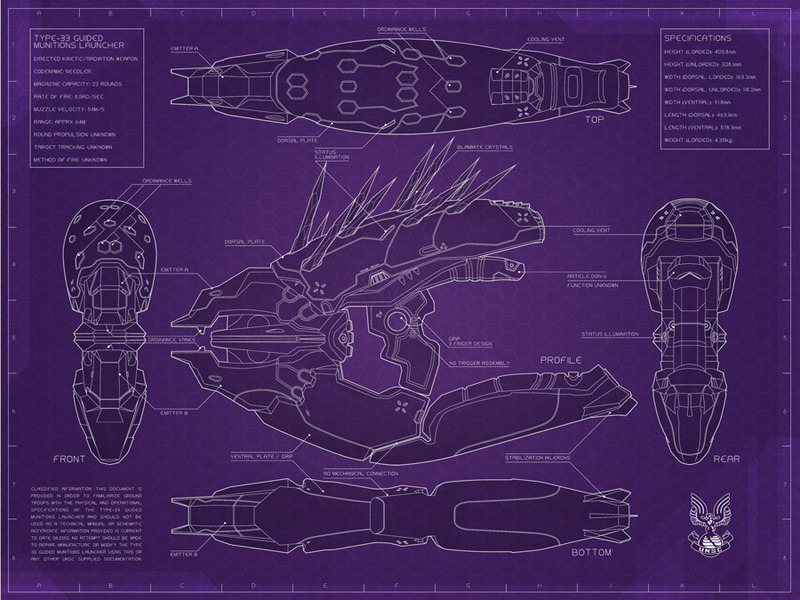 Illustrated from photos of my finished Needler replica, this is a bit less believable as an actual technical document but nonetheless looks cool! All of the vague information the UNSC knows about the Type 33 Guided Munitions Launcher is compiled here along with some of my own notations that were picked up during the project – like the fact that there’s not really anything actually holding the lower padded grip in place. Levitating assemblies are apparently commonplace enough in future alien wars that nobody seems to point it out, but that’s kind of weird in my book. Also in my mind the UNSC prints their tech spec documents on purple hexagon-tiled paper. I’m clearly not an engineer.